The cloud should be a valuable ally in helping organizations eliminate backup infrastructure and increase their disaster recovery (DR) confidence. The reality is that current cloud backup and DR solutions fall short because they don't fully exploit cloud resources. Most cloud backup and DR solutions still require on-premises infrastructure and actually increase costs by requiring multiple data protection copies, both on prem and in the cloud. 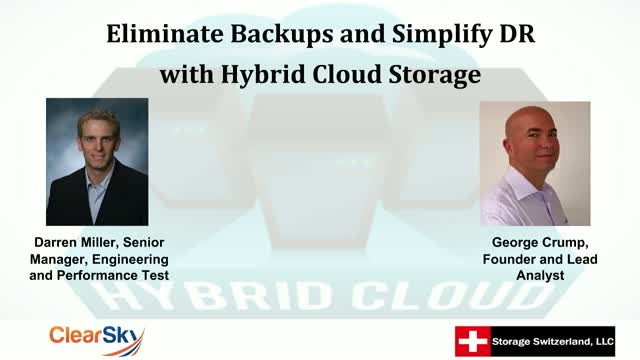 In this live webinar join Storage Switzerland and ClearSky to learn why current solutions aren't doing enough to eliminate backups or simplify DR and how a complete, hybrid cloud storage service can meet these goals without compromising performance.